While a state of emergency is still in place at home, global sporting events are providing an irresistible opportunity for protesters to be seen and heard. Athlete protests at the 2016 Rio Olympics provided a public relations nightmare for the Ethiopian government. Credit: Fernando Frazão/Agência Brasil. As she crossed the finish line in Sabadell, Spain, on 7 February, Ethiopian star athlete Genzebe Dibaba had attained her sixth world record. After a disappointing silver medal at the Rio 2016 Olympics, running the fastest 2,000 metres ever for a woman marked a good start to the year. However, Genzebe’s triumph caught the attention of many of her compatriots for political rather than sporting reasons. As she celebrated her victory, someone from the cheering crowd threw a flag at her. Genzebe picked it up, but immediately realised that the horizontal tricolour of green, yellow and red lacked something in the middle: the flaring yellow star on a blue disc. She quickly dropped the flag and waved to her fans instead. A similar incident had occurred in the January Dubai marathon in which Ethiopian athletes won a clean-sweep. In the glow of that victory, the women’s race winner Worknesh Degefa was handed a non-starred flag, which she also swiftly discarded. 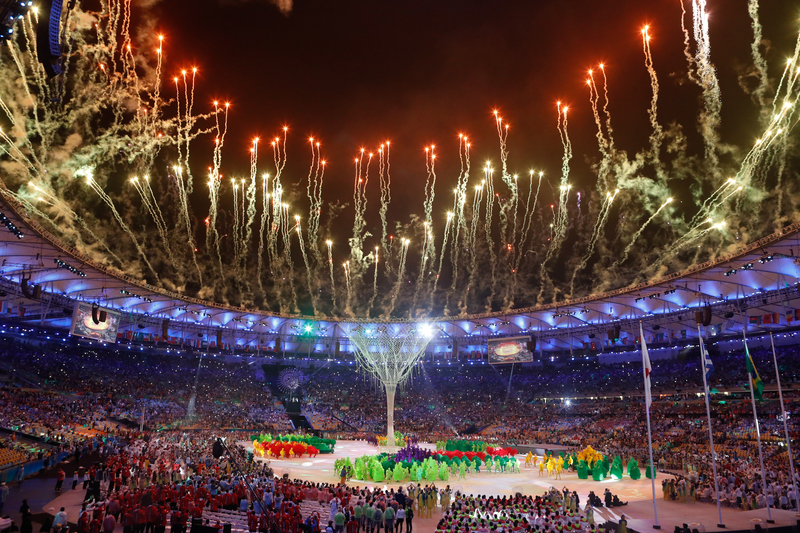 These incidents stirred some controversy, but they would have stirred much more if the athletes hadn’t acted so promptly – not least because a 2009 Ethiopian law bans citizens from displaying the unstarred flag. The current Ethiopian flag was introduced by the ruling Ethiopian People’s Revolutionary Democratic Party (EPRDF) in 1996 as it ushered the country towards a federal system of government organised along ethno-linguistic lines. The star – added onto the plain tricolour – was meant to symbolise the ethnic and religious diversity embraced by the new structure. But some nationalists renounced this modified version, claiming the EPRDF’s system undermines Ethiopian unity. Some have thus come to see the older non-starred flag as an emblem of a bygone era and symbol of protest. In 2014, US-based activists tried to lower the official flag at the Ethiopian Embassy in Washington DC. Two years later, activists succeeded in changing the official banner with a non-starred one at the Embassy in London. And the old flag became a clear sign of resistance when the Amhara, the country’s second largest sub-nation, joined the Oromo, the largest, in protesting against the government in 2016. Global sporting events have also provided a strategic site for these symbolic struggles. As sports journalist Elshadai Negash points out, the convergence of sport and politics in Ethiopia goes back decades, with the country boycotting the Olympics in 1976, 1984 and 1988. But while these previous actions were led by the government of the time, sporting events today are more likely to be used for political purposes by activists to oppose the government. After winning the 10km race in the UK in 2013, for instance, Guddina Dabale defiantly flew a flag often associated with the Oromo Liberation Front, an outlawed secessionist group. And as protest intensified in Ethiopia from late-2015, big international sporting events became a useful space to increase the visibility of dissent against the government. The apex in this intersection between Ethiopian athletics and politics so far has been the marathon event at the Rio Olympics. At the finish line of that race, silver medallist Feyisa Lilesa crossed his wrists over his head, a gesture widely used by the Oromo protesters. His lead was followed by others, including Tamiru Demisse who made the signal, which symbolises being handcuffed, as he competed in the 1,500 meters event at the Rio Paralympics. For Feyisa, who is now resident in the US claiming his life would be in jeopardy if he returned home, global sporting stages provide an invaluable opportunity to draw widespread attention to injustices. “Athletes like me, who have the chance to go abroad for competition, when they get such an international stage like this and win, they need to speak out,” he told the German broadcaster DW. Indeed, Feyisa’s actions made international headlines as activists in the diaspora capitalised on the moment to highlight their cause, generating plenty of coverage. Feyisa “opened so many doors that we’ve been knocking on for years”, noted Mohammed Ademo, an Oromo activist and US-based founder of Opride. With the actions of certain athletes providing a public relations nightmare for the Ethiopian government, several prominent athletes back home have spoken out against the politicisation of sport. Three-time Olympic gold medallist Kenenisa Bekele, for example, appeared on the state broadcaster to denounce athletes who made political statements, saying “politics and athletics do not go together”. Meanwhile, double Olympic gold medallist Haile Gebrselassie, who now heads the country’s athletics federation, has warned that he will take harsh measures against any erring athletes. Haile had previously invited criticism for commenting that “democracy is a luxury”. But Sileshi Sehen, an Olympic silver medallist and chair of the Ethiopian athletes association, argues that Haile is ultimately guided by what is best for the competitors. “He was an athlete for many years; he understands all the pressure that comes from different sides,” he says. According to Girma Gutema, an Oromo activist based in Norway, there is a divide between many of today’s athletes and previous cohorts. “The new generation of Ethiopian athletes are relatively more educated, vibrant and visible on social media [than many] politicians in the ruling party”, he says. But as the examples of Genzebe and Worknesh quickly dropping the unstarred flag demonstrate, not all of Ethiopia’s current athletes want to use their profile to protest. While athletics is proving useful for politics, politics is proving awkward for many sportspeople. Nevertheless, as discontent continues to simmer in Ethiopia, the global stage and attention provided by athletics events may remain an irresistible opportunity for activists to express political messages. As the state of emergency remains in place, it is one of the few avenues for protesters to still be seen and heard, says Girma, “so long as the government continues to muzzle the political space for the expression of dissent”. Kalkidan Yibeltal is an Ethiopian writer and journalist based in Addis Ababa. You reminded me of Ethiopian Falktale: once upon a time 3 men left for a voyage.They traveled all day n eventually night came; no ledge, even no hut but just bush. They decided to snooze for the night under a tree. One of them who is fearful of hayenas slept at their middle. All where tired n fall asleep. A hayena came n started on the foot it found. One of them was alerted by the stinky smell n cracking bones, ‘I hear something eating a bone n smells bad!’ The one in the middle who was taller than all being eaten by hayena goes, ‘shhhhhh! a hayena is eating me please be quite!’ So are all those who r quite today. Otherwise everything is intermingled; politics cannot be excluded from politics: why Gabrasillasie Haile once challenged Malasa for presidency? Even if he is not at a level of political leadership he has learned something through life experiences (not sure of school). How Lelisa’s uncle aunt cousins countryman even non related people affects him directly or indirectly, even if didn’t affect him, it’s humanity thus nothing wrong to expose such injustice – it’s the right thing to do. No wonder if the diehard Derg supporters and former privilaged families of the Haileselassie era, some of them who bought a ticket to the US with stolen money from the people(kebele) cry day and night, when they see right before their eyes, the system which garanteed them those previllages vanish for good. Offcourse there are real issue and real cause for protest back home. But this are legitimate, valuable and not destractive or for voilence destruction and overthrow of government. Putting a star in the middle of the Ethiopian flag is a ploy designed and implemented by tigre woyane to deceive the various nationalities who live together for centuries as Ethiopians. the tigres told these groups that they were not represented in the country in any form in the past and that the star was suppose to show they were going to be represented . the truth is different. the tigres despite making 5 % percent of the population hold every little or any semblance of power in the country. the tigres exploit resources from regions occupied by these groups in the name of EPRDF which theoretically is a coalition of parties from these groups. in reality, it is all woyane tigre that rules and exploits the country. the tigreans come from resource starved region . when the current rulers started as a rebel group, they were able to recruit thousands of tigreans who were fleeing their villages that were stricken by drought and famine. the rulers did brain wash these foot soldiers and the tigreans as a whole that they are going to create a new state that is going to be developed at the expense of the other groups in the country. this has been going on for the last 25 years. Ethiopians use every opportunity to high light this fact and the story of the sign in the middle of the flag. the athletes are scared to pick up the right flag because they want to go back and do not want to be in trouble. they do not care as long as they manage their comfortable life in the midst of misery. the majority of these athletes are like prostitutes who sell their siblings and their own soul for a little money.